A medical drama set in the world of catatonic patients, Awakenings benefits from an inspirational story and extraordinary performances, but does suffer from some excessive dosages of syrup. In 1969, the socially awkward Dr. Malcolm Sayer (Robin Williams) joins the staff of a New York Hospital and stumbles upon an almost forgotten wing where unresponsive patients in long-term catatonic states are cared for, including a man called Leonard (Robert De Niro). With help from nurse Eleanor Costello (Julie Kavner), Sayer discovers that the patients do respond to sudden stimuli. He suspects that their brains may still be functioning at some level, and investigates a potentially common cause for their condition: they all contracted encephalitis as children. After consulting with expert Dr. Peter Ingham (Max Von Sydow), Sayer hypothesizes that the patients are suffering an extreme form of Parkinson's disease triggered by the encephalitis. When the new experimental drug L-Dopa becomes available, Sayer administers it on a trial basis to Leonard. It takes a strong dose, but Leonard is suddenly awakened, and appears to make a remarkable recovery. With Leonard exploring the world around him including befriending frequent hospital visitor Paula (Penelope Ann Miller), Sayer convinces the hospital administrators, including the skeptical Dr. Kaufman (John Heard), to similarly treat all the catatonic patients. But the euphoria of success is soon tempered by the emotional and physical implications of the medication. Awakenings is based on a true episode from the life of British neurologist and author Oliver Sacks. Directed by Penny Marshall from a Steven Zaillian script, the film opens with Leonard as young boy gradually losing his ability to write coherently, before jumping ahead about 40 years. From then on Awakenings is almost entirely set at the nondescript hospital, a kind and gentle place where the catatonic patients receive decent care but are otherwise all but forgotten. 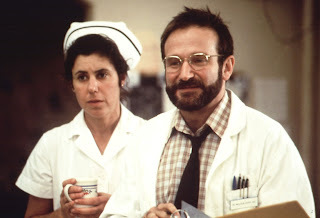 The film proceeds at a slow and steady pace, Sayer (a restrained Robin Williams performance) the one major character exploring his way through the hospital and other than Costello, finding few sympathetic ears. Kaufman and his colleagues are not too interested in doing much of anything for the long-term catatonic patients, and Sayer faces passive negativity in trying to overcome the inertia of a do-minimum treatment regime. Once the L-Dopa medication is administered, Leonard awakens and becomes the second major presence. This gives the film a major boost as De Niro steps forward and gets to deploy his impressive skills as a man getting reacquainted with a world he unwillingly left as a young boy decades ago. Leonard then begins to struggle with unanticipated side-effects, and De Niro lets loose in an impressive display of physical discomfort and mental anguish. 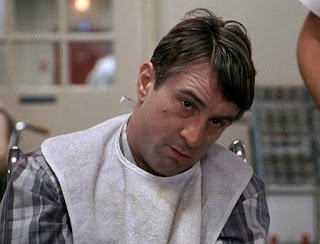 The combination of Williams and De Niro (who was nominated for the Best Actor Academy Award) both in top form is irresistible, and they carry Awakenings towards some impressive emotional peaks. While the film has undoubted good intentions and plenty of heart, the lingering suspicion begins to creep in that the story is much ado about not very much. Sacks was adept at writing about his achievements, Hollywood is always good at manufacturing heroes and inflating accomplishments, and the two come together for a grand rendition of what ultimately was a limited success story, more a footnote than a breakthrough. Which still takes nothing away from a well-constructed and human-centered drama, an uplifting but grounded story of hope and science briefly lifting a dark veil of despair.